1. Take the Inklingo Quiz. 2. Go directly to the quiz answers HERE. Any ordinary Inkjet printer—like yours! Print shapes on the wrong side of the fabric with the Inkjet printer and color ink cartridge you have already. Fabric feeds smoothly through an Inkjet printer when it is ironed to freezer paper. It prints just like paper. Any ordinary color Inkjet printer will allow you to print custom sizes to use fabric efficiently. There is more about printers on the website. DO I HAVE TO LEARN NEW SOFTWARE? No! Pages of Inklingo shapes are organized in a PDF file that opens with Adobe Reader. There is no software to install. Just enter the page number (or use the bookmark feature) to print the page with the shape and ink color you need. It’s simple but you will want to read our tips too. There are 20 Inklingo colors which are designed to wash out—but even if they don’t, they do not show in the finished quilt. There are tips for choosing the page with the best color of Inklingo ink in the first chapter of The Inklingo Handbook (included in the free shape collection). IS THIS JUST FOR HAND PIECING? No! Sew by machine or sew by hand with a running stitch, or combine hand and machine stitching for a “hybrid.” Inklingo introduces new, simpler ways to stitch. 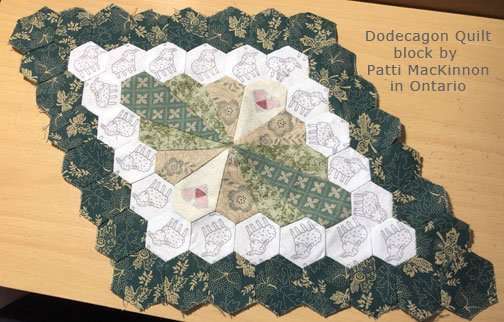 There are instructions for piecing and appliqué in the handbook and on the blog. CAN A BEGINNER DO THIS? Yes! 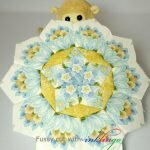 Inklingo is perfect for beginning quilters and for children too. Cut with a rotary cutter or scissors. No measuring! Just cut and sew along the lines. There is straight grain on every piece. 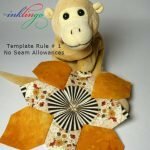 Inklingo makes it easier than ever to start quilting. Vist the Inklingo web site for more info! 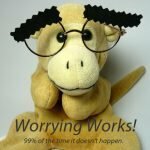 Does inklingo work with MAC computers and iPads ? Does it matter if I print Diamonds or Hexagons on the bias? I mean do both pieces that are sewn together have to be cut out in the same way? Or is it not important if one is in the bias and one on the straight grain? Uff, Is that understandable? Hi Deb, I’m sorry but I did not have time to do videos for the rest of the clues, but there are detailed, illustrated instructions in the PDFs on the blog. If you find it easier to position the ruler on the line first, that is fine. I prefer to plant the blade first because I think it is safer. It won’t make any difference in accuracy. 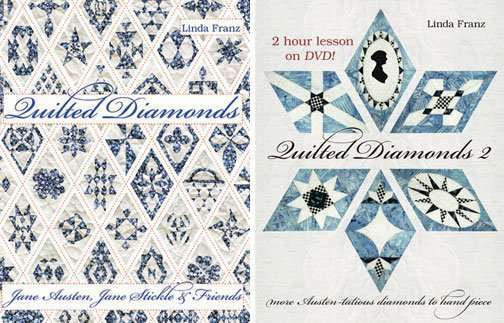 You can see my rotary cutting tips in the first chapter of The Inklingo Handbook in the free Diamond Triangle Square shape collection, especially page H29. I am pleased to know you are enjoying Inklingo for Celtic Solstice! If you have any other questions, please ask. I am happy to help. I’m loving using Inklingo with Celtic Solstice clue 1. I’ve watched your youtube video for clue 2, and wondered if you’ve done any videos for clues 3-6? Also, what is your reason to set your cutter blade first then line up your ruler? It’s taking me forever to get the blade on the line with the slight shaking problem I have. Is it just your preference or does it make a big difference in accuracy? Thanks for the super-fast answer. I let you know if pigment ink behaves differently for this application. Do you have any opinion about dye vs pigment printers for Inklingo? I have a very nice 13″ pigment printer (Epson) and an ordinary 8 1/2″ dye printer (Epson). Thanks! fabric with each of them and compare. These links will get you started. 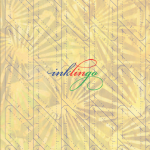 Inklingo uses an ordinary Inkjet printer with the ink that is already in it, not pens. Each shape is provided in efficient layouts and each layout is provided 20 times (20 pages) with colors that will wash out. If you have any other questions as you go along, please ask. There is always a simple answer and I am happy to help. Hi: Linda: I found that the printer will not print onto black fabric. Inklingo works on most dark and black fabrics, but not all. There are some great tips for printing on dark fabric in the Top Ten Tutes (tab on the blog). If you have any other questions, please ask. I am happy to help. I am having trouble printing the designs on some fabric with freezer paper. My printer will tell me the printer is out of paper when it isn’t. It will sometimes printer some on the paper and the stop and shoot the paper and fabric out. It will tell me that the paper size is not correct when it is. I can print the designs on plain paper with no problem. Ideas? I was successful with some fabric but some batiks have not been doing well. Suggestions? Your printer issue is not common, but it has happened to me too on one particular HP printer. It usually happened when I was using a dark fabric. The problem was solved for me when I positioned the fabric so that an eighth of an inch of white freezer paper showed on the leading edge. Please try it and let me know how you. It might prove my theory that the printer was looking for a white edge of paper before it started. By the way, there are tips like this in the first chapter of the handbook, which you have (included in the FREE Diamond Triangle Star shape collection). There are several great tips in that chapter. This one is on page H38. Thank you for writing. Happy Thanksgiving from Canada. I have come across your website while visiting another, Bonnie K Hunter & Quiltville.com. Why have I not heard of this before. It sounds great. Hi Paula, I am sorry you have had jams. There are instructions in the first chapter of the Inklingo Handbook, which is included in the free shape collection. Most jams are caused by the fabric separating from the freezer paper in the printer. You should be able to avoid jams by using fabric which has been washed (remove the sizing), and a hot dry iron on both sides (fabric side and paper side). There is more detail in the handbook, but if you have any problems, please email me at linda@lindafranz.com. I am happy to help. I have a new Epson 645 Workforce All In One Printer and have been unable to get it to print the fabric ironed to freezer paper. It jams every time. Any suggestions? PS. The delivery of my product was fast, and your notes inside were very nice. Start free on the Main Beginner’s Page!